Remember the old-time church social, as Grandma's back yard picnic was highlighted by that creamy, cool and delicious dessert? Well, you can still do it... right in your own home, school or church. All you need is your favorite ice cream recipe, ice, rock salt and, of course, your White Mountain Electric Ice Cream Freezer! Enjoy smooth, creamy home made ice cream in 20-40 minutes depending on ingredients. Easy to use and clean up this unit includes a recipe and instruction book with hints and tested ice cream recipes to insure great tasting old fashioned ice cream every time. 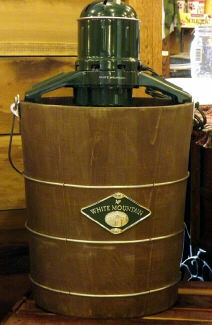 New England White Pine bucket with slide & lock brackets.